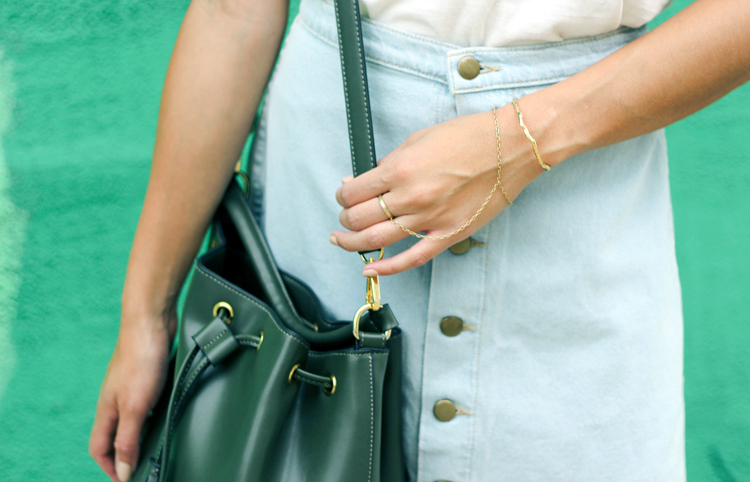 The one Fall skirt every girl should own. See by Chloe tank, Button-front A-line denim skirt c/o American Apparel, Vintage hat, Old Navy bucket bag, Jennifer Fisher gypsy ring, Zara gladiators (similar here). Shot by Isaac Lacey. September is almost here, and with that in mind I've been trying to get the most wear out of a few wardrobe items that I know won't transition well into Fall. Top on my list are summery sandals, like these lace-up gladiators, which I'll surely be swapping out for boots soon. On the other hand, there are also a ton of items in my closet which I know I'll be wearing far into the new season, and this denim A-line skirt is no exception. Button-front skirts are undeniably having their moment in the fashion spotlight and as a lover of all things denim, this one was calling my name. Wear it now with sandals and a loose tank, then rock it later with a cozy cropped sweater and knee-high boots. The possibilities are endless! Love the denim skirt! Bag and sandals are gorgeous too! Great match, you are beautiful.Find more stylish replica Celine Bags, replica Hermes Bags, replica Givenchy Pandora, and more replica designer bags.